We've added some new $0 Down plans with *FREE Equipment + *FREE Installation. NO PHONE LINE REQUIRED. It's never been easier to Upgrade, Switch Over from a competitor or install a New Smart Package at your Home or Business. We also have new security bundles, LARGER easy-to-use TouchScreens, free apps, e-mail alerts, arm/disarm with your smart phone, automatic doors, automatic garage doors, automatic lights, HD Wi-Fi doorbell cameras, no phone line options, smart thermostats, geo-services, video verification...and a whole lot more! We do not provide pricing on our web site or over the phone. 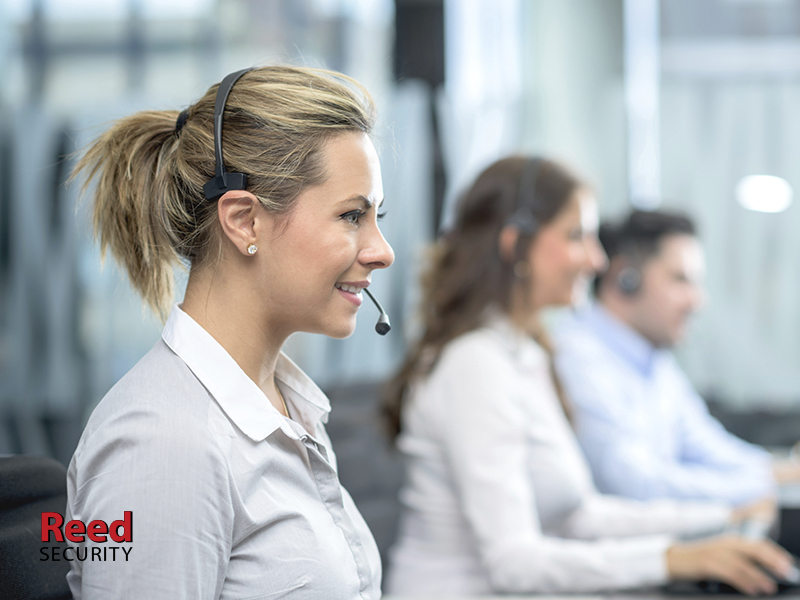 Instead we offer a No Obligation, Free Security Evaluation with a Reed Security Consultant. We carefully listen to your needs and wants and walk through your Home/Business and point out how intruders can gain access. Then we share options on How to Properly Protect You and Help You Feel Safe. It only takes 30 minutes. If you would like a preview of some of the new technology we have available Click Here. What are you waiting for? Contact Us online today to book your No Obligation, Free Security Evaluation. 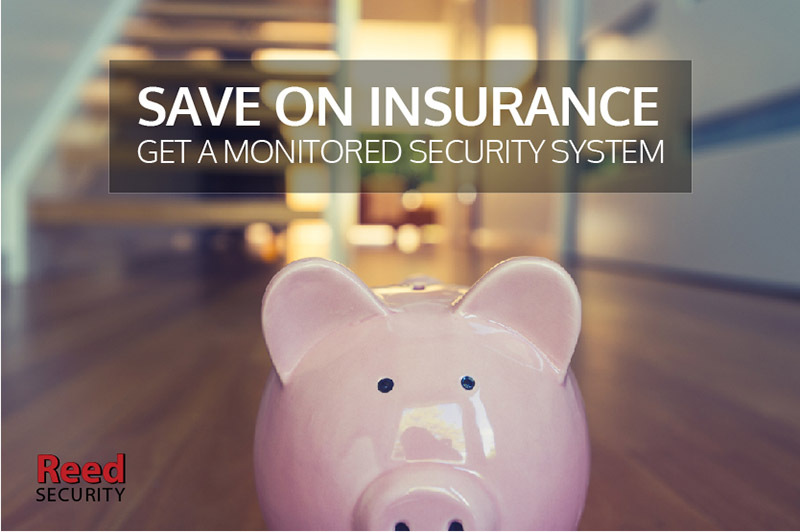 Depending on your policy you may qualify for an insurance discount of up to 20% when you have a monitored security system. Reed Security protects a number of local insurance brokers including The Co-operators, Cherry Insurance, Cooke Insurance and Saskatoon Insurance Agencies. We contacted them for advice and we found the discounts vary between insurance companies. The main reason an insurance company provides a discount is because it’s less likely you will have a claim. In fact, it’s 400% less likely to have a break-in or major loss when have a monitored security system. Sometimes the insurance discount can even pay for the entire cost of your monthly security fees. If your home insurance policy is $1600/year and you received a 20% discount, you would save $320/year on insurance costs. If the monthly 24/7 monitoring fee you pay to your security provider is $21.95/month (x 12 months = $263.40), then you would save $56.60 every year. Some insurance companies provide a discount of 10% to 15% no matter what 24/7 monitoring coverage you have. Other insurance companies will provide additional discounts when you have monitored fire, flood and low temperature protection. To determine exactly how much you can save please contact your local insurance broker. WARNING: If you cancel your 24/7 monitoring service with your security company you should let your insurance broker know immediately. If you were receiving an insurance discount based on lower risks – you don’t want to run into any problems when you need to use your insurance. Security companies provide records to investigators. Not everyone will qualify for an insurance discount including most Businesses. Even though you may be able to save money by installing a monitored home security system, it isn’t the main reason People install them. 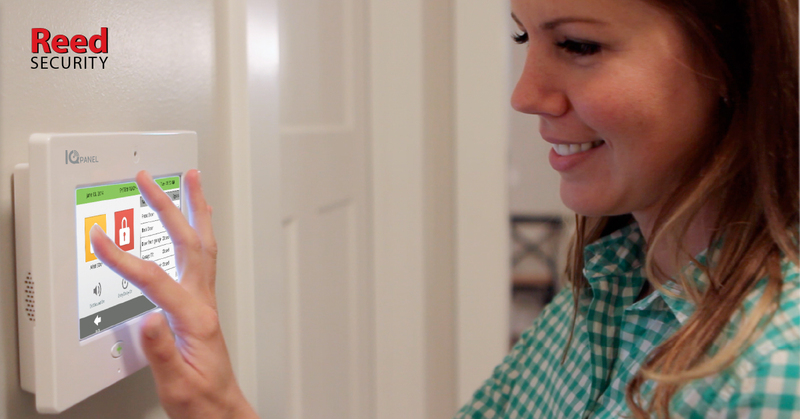 Installing a Reed Smart Security & Automation system helps you feel safe and keeps you connected to your home or business. Alarm.com is super popular. It allows you to control your smart security system, smart locks, smart lights, smart thermostats and ReedHD™ cameras from your smartphone. Instant Email/Text notifications are a hit too. Alarm.com will let you know when your son or daughter arrives home after school. No phone line is required. It's that time of year when you will be getting pressured by aggressive door to door salespeople. They will be pushing you to sign you up to "limited time offers" that expire "right away" (because they do not have a local office). And before you know you know it you're on the hook for thousands of dollars. Several alarm companies only have SUMMER PROGRAMS. They rent houses and hire large crews of university students which are offered large commissions ($400 to $500 per contract) to get you to sign up. LEARN MORE by Googling "door to door alarm scam". Sales person won't leave even when you tell them to "Leave"
Sales person won't leave when you tell them "No Thanks"
Sales person won't leave when you say "I Already Have Your Products or Service"
Sales person name drops the name of your neighbor and makes it sound like "they signed up" or "they bought one" or "they referred me to you"
Put Up Your Hand and "Say NO". Immediately close the door and the sales person will eventually leave. Tell them "You are Trespassing" and that you are calling the BBB Better Business Bureau, Consumer Protection Branch and the Police if they do not leave. Always Get 3 Quotes for whatever you consider purchasing. This gives you the time to gather information and to check if the "deal" being presented to you is the best option. Never Accept Quick Delivery of a product or service. This gives you a cooling off period and more time to gather facts. If you did proceed with the offer You Have 10 Days to Change Your Mind and CANCEL (and get a full refund). It's the Law in Alberta and Saskatchewan. 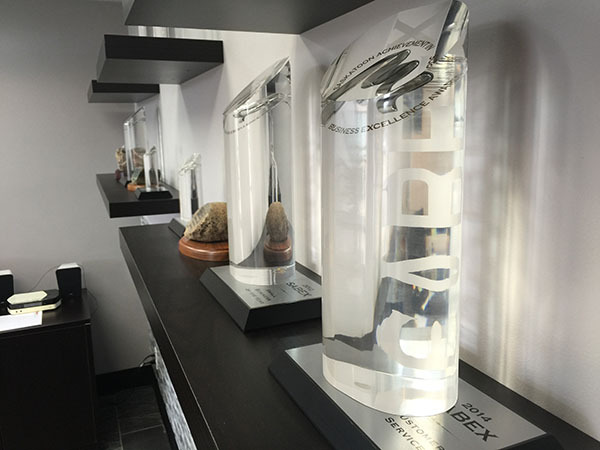 Reed Security has received 20+ Award Recognitions for the way we look our our People and Customers. We're Local, We Care and We Can Help! 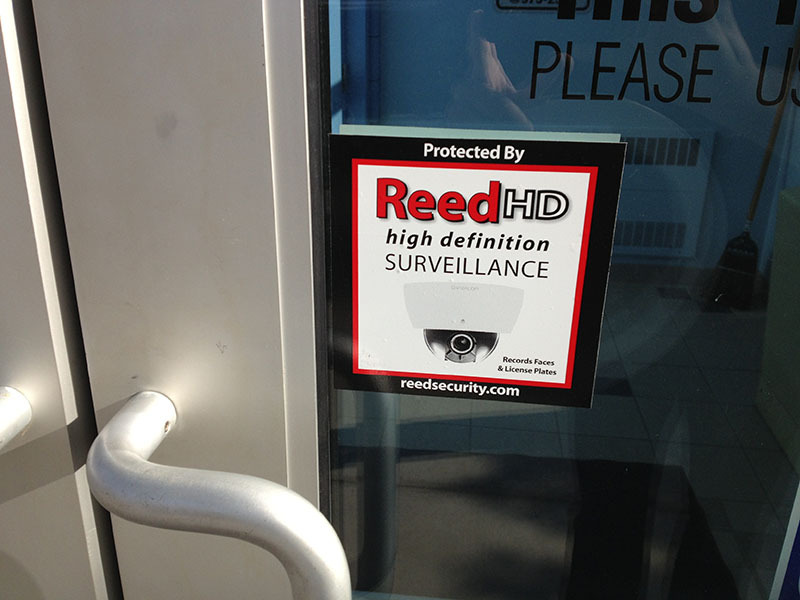 ReedHD™ Hi-Def Security Camera systems have become an important tool for businesses and families. CCTV systems of the past were bulky and expensive and only banks, airports, large retailers, grocery stores and big businesses could afford them. Not anymore! Thanks to early adoption, mass production and payment plans ReedHD™ Hi-Def Security Camera packages are very affordable. We still install video surveillance systems at traditional businesses, but they can now be found just about everywhere – small businesses, gas stations, local restaurants, boutique stores, farms, grain processing facilities, mines, construction sites, schools and at homes. 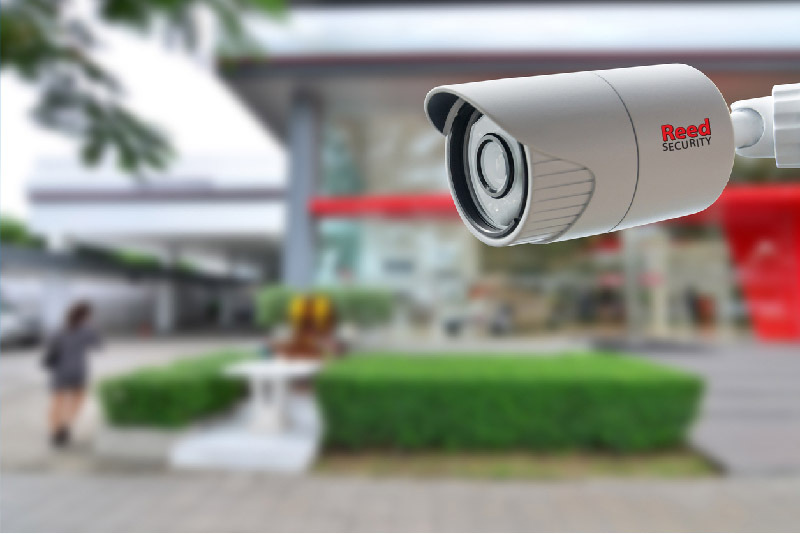 So, what should you look for when shopping for a modern HD video surveillance system? We recommend the “try before you buy” method and demo the system you are considering investing in. We have a variety of systems to fit every budget, but the general rule is you get what you pay for. A user managing 4 cameras at a single site has different requirements than a Security Manager that manages 200+ cameras in multiple cities. Our certified technicians will professionally install your ReedHD™ Hi-Def Security Camera system and ensure you understand how to view cameras on your smartphone, search for evidence and make a back-up for the Police. 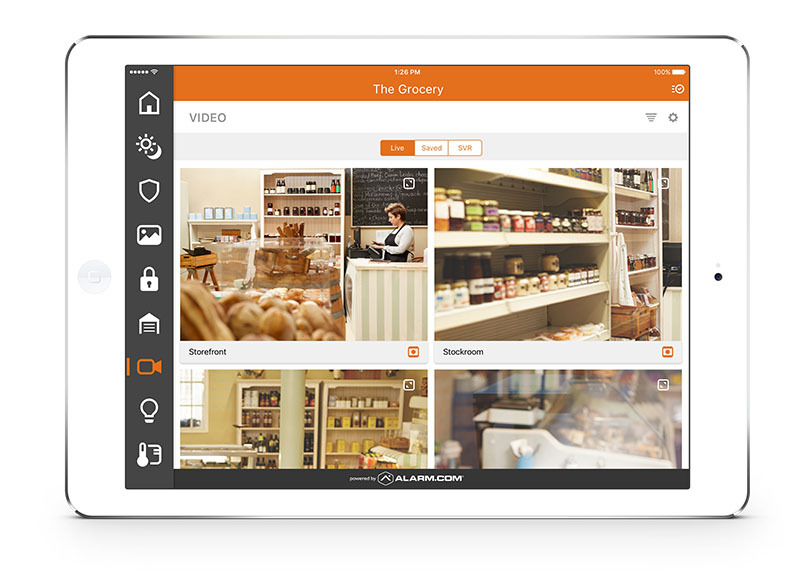 The image quality of security cameras and recording lengths are performance indicators. Security cameras have resolutions ranging from VGA (640x480) to 7K (7360x4128). Some companies advertise “HD quality”, but the cameras may only be 720p (1280x720) HD. You will find a lot of these cameras at Costco and on-line stores. 720p HD is great for a homeowner or small business wanting the basics, but 1080p (1920x1080) should be the starting point for high definition security cameras. We go above and beyond with ReedHD™ Hi-Def Security Camera packages and often use 4MP (2560 x1440) which is 30% greater than 1080p. 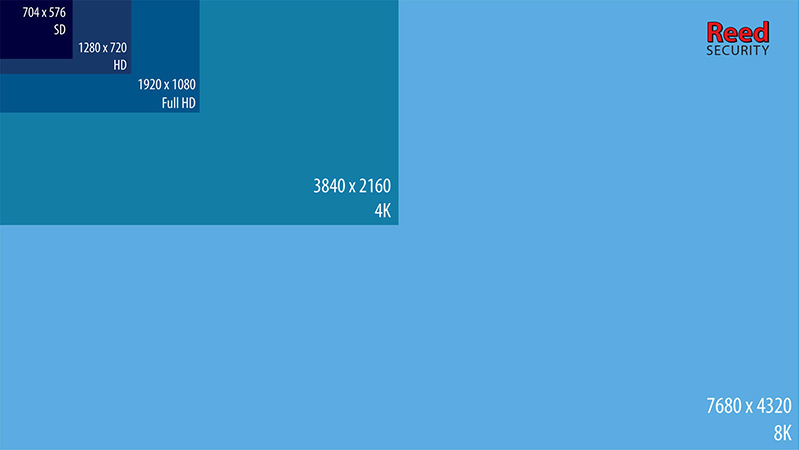 Ultra HD 4K (3840x2160) will soon be our new standard. The higher the security camera resolution, the more details you will get on playback. This is extremely important when using our digital zoom tool when looking for evidence. We have samples of HD video surveillance on our YouTube channel. If you have a compound or construction site you should consider ReedHD™ Smart Cameras. They have built in video analytics and that can detect People and Vehicles or when an object is removed from the security camera view. Next they alert you via smartphone or our UCIT Video Monitoring Stations (who will dispatch the Police). This is an effective way to intervene while a crime is in progress and reduce losses. You should also pay attention to the NVR (network video recorder) and storage requirements. HD Security Cameras use a lot of storage so the first question should be “how many days would you like to record for”? At Reed Security we use a camera calculator tool that factors in the amount of movement, the scene, the frames per second and the resolution of each HD security camera. Most people need 14 days to 30 days of recording before recycling the data. An NVR with 4 cameras should have 2TB of storage, 8 cameras should have 4TB of storage, and 16 cameras should have 8TB of storage as minimums. Most people forget that you also need a fast high speed internet connection to view the HD security cameras remotely on your smartphone app. At Reed Security we work with you and your internet provider to make sure you are on the right package for downloading and more importantly uploading video. We recommend a package with 1 MBPS upload for a quality remote viewing experience. Having an expensive 7K (29MP) HD security camera that can record license plates from 2000 feet away won’t do you any good in poor lighting conditions or if there is an obstructed view. We have installed nearly 20,000 security cameras and have consulted local Police services on optimal placements to help solve crimes. An experienced Reed Security Specialist knows which cameras to install where to ensure your video surveillance solution is effective when you need it most. We also recommend placing several Protected by ReedHD™ warning signs and decals at a site to make potential criminals think twice before committing a crime. Internal theft (employees, shoplifting) is far more common than external theft by an 8:1 ratio. We install warning signage on the inside of the building too - in particular high risk areas such as cash registers and exits. What should a HD security camera package cost? If you want an inexpensive system and you are prepared to install it yourself then consider Costco. A very basic system is $500 to $2000 (no labour) and the quality is OK for a basic home or small business. Disadvantages are: poor storage capacity, poor HD quality, poor reliability, poor warranty, no customization of views, pre-made (maximum 25 feet) cables that limit installation locations and if you are not tech savvy a pain to setup for remote viewing on your smartphone or desktop PC. ReedHD™ Hi-Def Security Camera systems are professionally designed and installed. Our solutions are customized to your needs and budget so the pricing varies. The price ranges from $2500 for a 4 camera 4MP HD security camera package to $100,000+ for a 60 HD security camera solution. The most popular option is our Business Bundles. One low monthly fee covers it all - equipment, parts and labour warranty, helpdesk tech support, on-site service and *free upgrades. It's also a great way to preserve your capital, deduct the payments on your corporate tax return and grow your business. 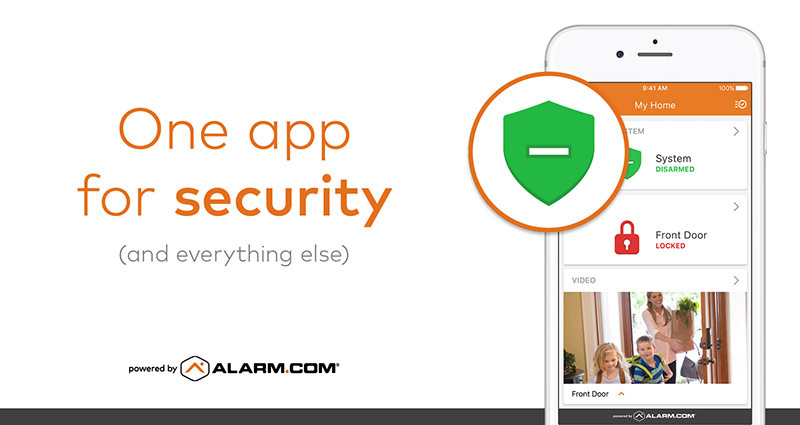 The Smartest Home Security & Automation system on the Block just became Smarter. 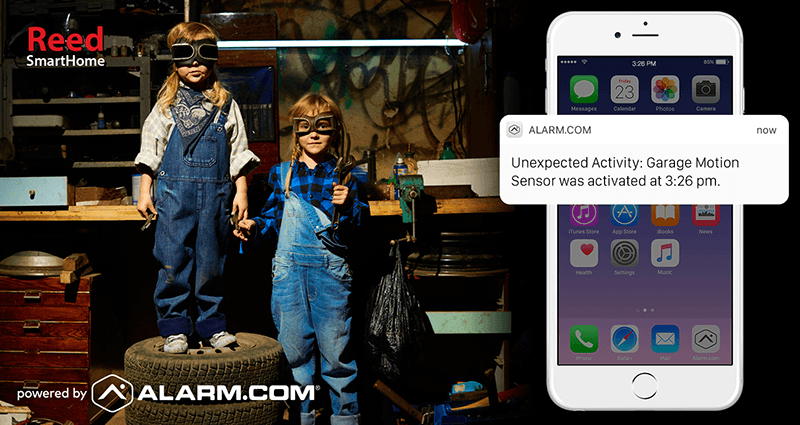 With Unexpected Activity notifications your Smart Home Security & Automation system can now look out for your Home and Family. 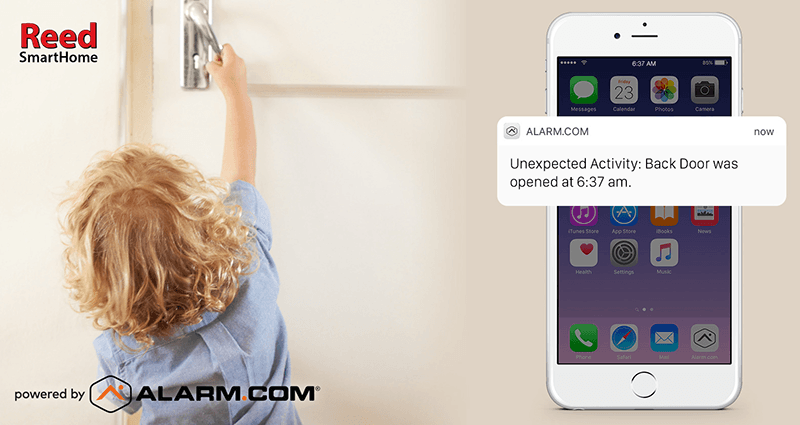 Alarm.com learns your family's routine and when unusual activity happens - you will receive an instant alert to your smartphone. It's a new type of proactive, intelligent protection. 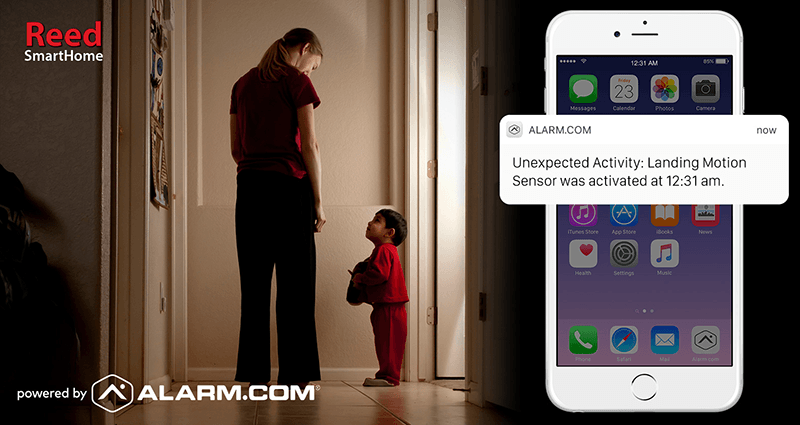 Unexpected Activity notifications can be triggered by door sensors, window sensors and motion sensors that you've placed in dangerous or forbidden areas of your Home or Business. Find out when the little people at your Home wake up in the middle of the night. Are they having a bad dream or stomach ache? A Reed Smart Home Security & Automation system can protect you and your kids from bad ideas that seemed good at the time.